It was basketball season in Grade 6 for Yusuf Ali. As he headed down the court, a defender approached him. Ali knew that he could gain an advantage if he bullied his way to the rim. And so he did. With this moniker, Ali is known for his veteran leadership and a willingness to sacrifice anything to win while overcoming any obstacle that comes his way. If you know him personally, you’ll know about his mantra: “risk it all.” At first glance, it’s just a slogan. But for the 5’11” guard, it’s the only way to live. Ali comes from one of the toughest communities in the city in the Lawrence West area, also known as the ‘Jungle’; a place riddled with drugs and gun violence. For Ali, a basketball career was a foregone conclusion when he found his way onto HooptownGTA, a website that posts the statistics of Toronto’s top young players. At the end of his high school career at Vaughan Road Academy, Ali expected several offers. Unfortunately, he didn’t receive a single one. He reached out to schools and participated in tryouts, but teams weren’t giving him the recognition he thought he deserved. He later tried out for the University of Toronto’s basketball team, but was told that he’d be a “redshirt”, which is usually given to someone to either lengthen their eligibility or further hone their skills. Ali had decided to take a year off and played for the Toronto Basketball Academy in the summer. He’d play well in his time with the camp, with his most notable performance came against Seneca College, when he dropped 33 points and caught the attention of multiple head coaches around the country. Opportunity arose when Ali was avidly recruited by then-Brock Badgers men’s basketball head coach Charles Kissi. With one of his best friends Johneil Simpson joining the program, it was a simple decision. Not expecting much when he first got there, the kid from Lawrence West went from the starting lineup to slowly falling out of the rotation in the 2014-15 season. To make matters worse, he was also becoming homesick. Being a middle child of 10 siblings, he felt an obligation to be at home and help his parents with his younger brothers. 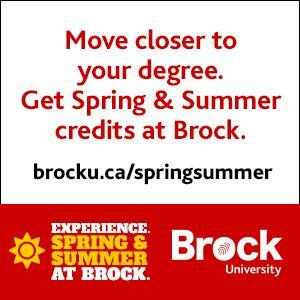 Between the homesickness and not genuinely enjoying his time at Brock, Ali decided to leave the university after his first year. Once word got out that he was no longer at Brock in 2015, head coach Darrell Glenn and assistant coach Rami Arabi of Seneca College reached out immediately. It was a step down from the U SPORTS level, it was the perfect opportunity to play close to home. But the transition to Seneca wasn’t as smooth as Ali expected. Joining a new squad where he felt as though nobody took the game seriously, it became easy to fall into bad habits. The team finished 9-11 that year, losing seven out of their last nine games. But, a new precedent was set from the coaching staff after the season. Weeding out the bad apples and turning the program into a basketball powerhouse, Seneca was on the rise and Ali would take his game to another level. He was selected as an Ontario Colleges Athletic Association (OCAA) all-star in 2018, leading the country in assists while Seneca finished second in their conference with a 17-3 record. While Yusuf found success on the court, his brothers were finding their own. Ahmed Ali dropped 103 points for John Polanyii Collegiate Institute joining Denham Brown as the only Canadians to score 100-plus points in a single game. With his career taking flight from there, Ahmed now currently plays Division 1 basketball in the National Collegiate Athletic Association’s (NCAA) Pac-12, starting at point guard for Washington State. While Ahmed drops buckets, Ali’s other younger brother Hassan also known as ‘Top5’ is carving out his own path in music. One of the most well-known underground rap artists in the city, the rapper has numerous songs with over a million views on YouTube, and his latest song “Half of Dis” currently has over 300,000. For Yusuf, everything was going great. Seneca was on the rise, head coach Glenn and Rami received an opportunity to coach at the University of Prince Edward Island (UPEI) and after such a successful second season, Ali was planning on joining them. Said Ali was murdered on July 31, 2017. To this day, his murder remains unsolved. To Yusuf, Said wasn’t only a brother, but he was also the heart and soul of the family. Known as a funny, charismatic and extremely confident individual, Said was often the smallest but played and talked like he was the biggest whenever he stepped onto a basketball court. Deciding to stay at Seneca to be close with his family, those first few months were tough for Ali. Losing one of the closest people to him, he found himself in a dark place, not wanting to be in school anymore while constantly daydreaming about his brother. Coming from a tough community, he had people in his ear expecting him to seek revenge for his brother. But that wasn’t the life Yusuf wanted. His religious faith, support from family and friends and knowing he wasn’t alone helped keep him afloat. Jay McNeilly had taken over as head coach at Seneca and was able to convince Yusuf to stay in school as their relationship flourished to much more than just a coach and a player. Basketball was an outlet for Yusuf, allowing him to dedicate an entire season to Said. Every bucket, every assist and every single win was in his honour. The team went undefeated, a perfect storybook ending that saw Seneca win its first national title. It was a year Yusuf will never forget, a tribute to his younger brother. 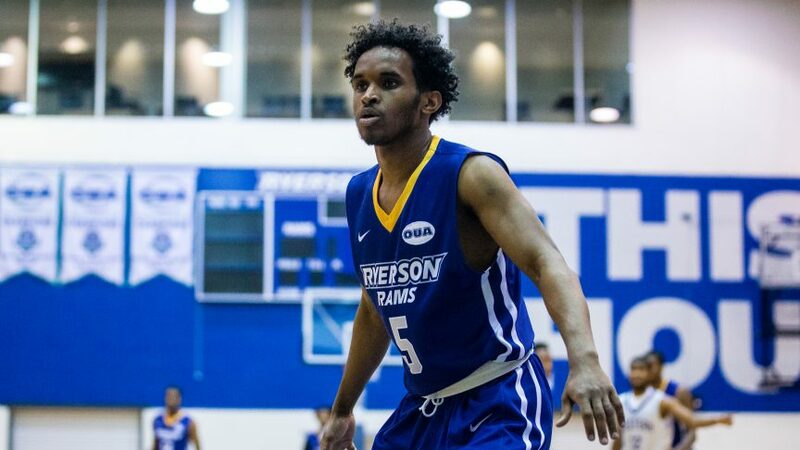 After such a triumphant third year at Seneca, Adeel Sahibzada, a former assistant coach at Ryerson (now at Daytona College) reached out to Ali about potentially joining the Ryerson Rams. Not taking the offer seriously at first and looking to return to Seneca for his final year, Yusuf began pondering the idea of making the jump back to U SPORTS. “Risk it all” once again came to mind. Leaving behind teammates that had become brothers, it was extremely hard for Yusuf to tell McNeilly that he was heading to Ryerson. 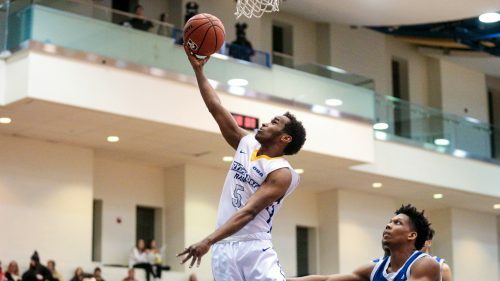 Coming to a Ryerson team that regularly competes for national titles, playing minutes weren’t guaranteed. But Ali embraced that challenge. As the 2018-19 season went on, he would not just earn his spot, but he’d make a mark on the team. People know him for putting the team before anything and putting the needs and concerns of others before himself. That’s the image that Ali’s name conjures. To many, he’s a guy that puts others first, an individual that has shown strength in a time when most would display weakness and the sheer desire to not let his shortcomings define who he is.